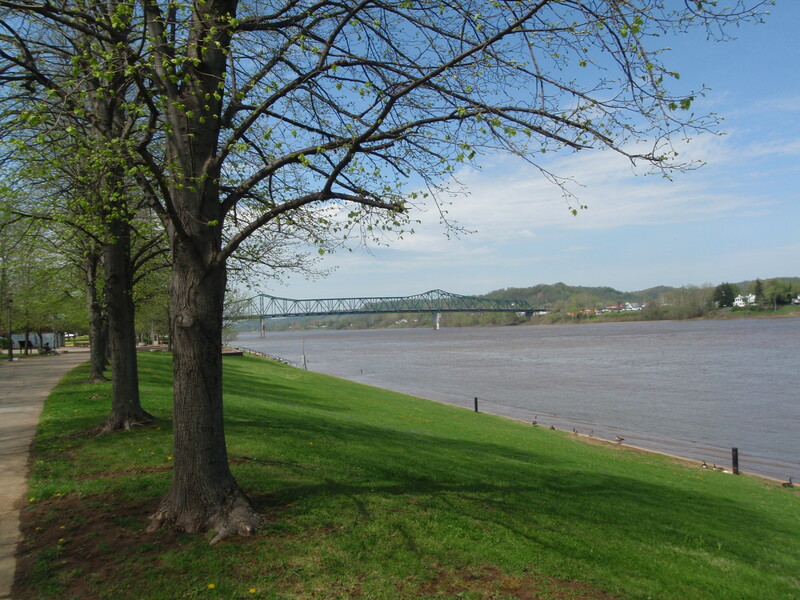 I stayed near Huntington last night, which is on the Ohio River right across from Kentucky. I thought there was a long river trail in town, but I could only find a short one, and I walked on it anyway. It was a pretty park, although lots of it was hidden behind tall concrete walls. At first I thought I was in some big industrial area, and then I realized the long wall was there to help prevent flooding when the river gets too high. And as I looked at the river, I once again have trouble understanding how it can rise so high, but I know it happens all too often. 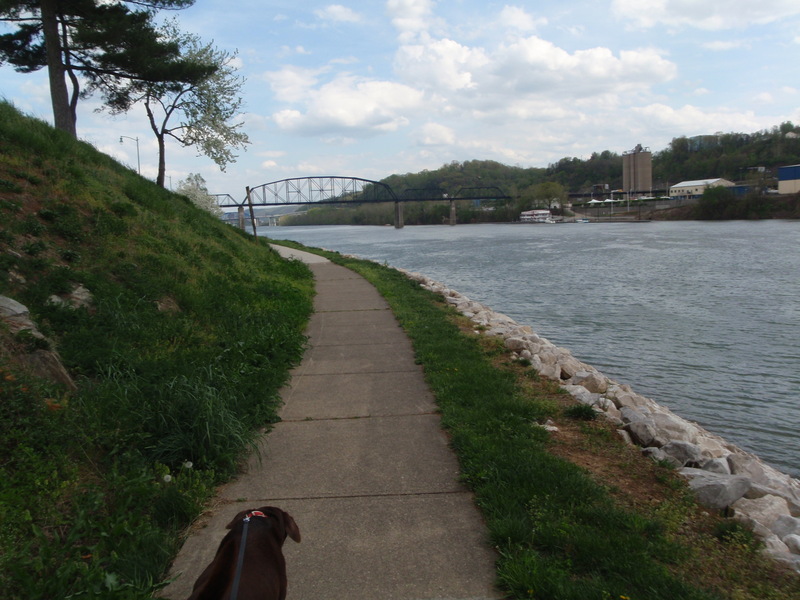 Tula came with me on that walk, since it was in a shady park and we only did a mile, and then I got another 2 1/2 miles in around town and Marshall University. 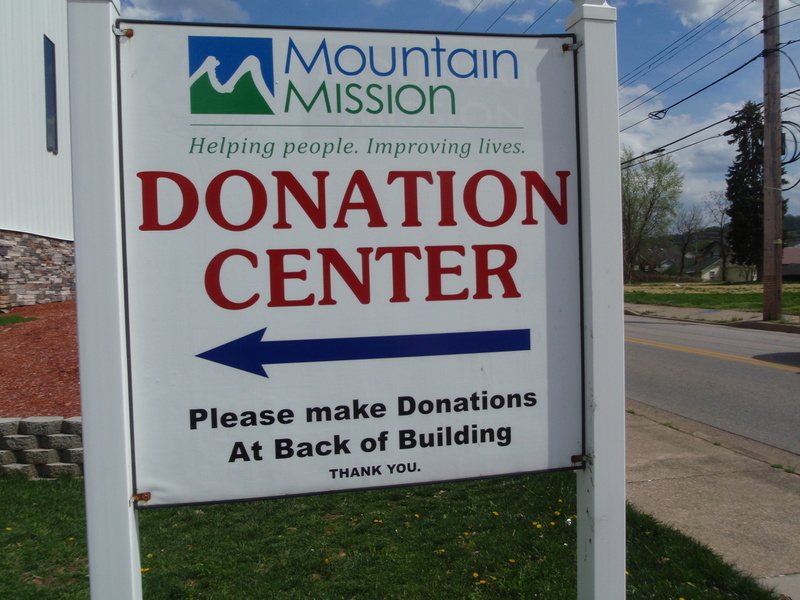 Then I called the Mountain Mission Food Pantry to see what sorts of things they need. I ended up getting a bunch of cereal, oatmeal, muffin mixes, pasta, rice, beans, and mac and cheese. 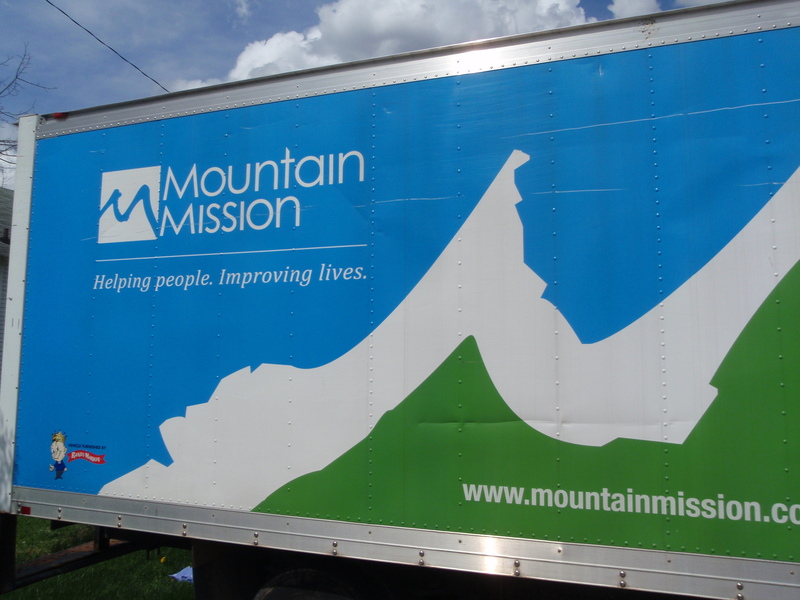 The Mountain Mission Food Pantry is located in Charleston, the capital of West Virginia. They gave me good directions and I found them and met Janice and John, the manager and director. They told me more about the people they help feed – 14,000 of them last year. Many of the people who seek their help are the working poor, who work full time at minimum wage, and can’t quite make the ends meet. 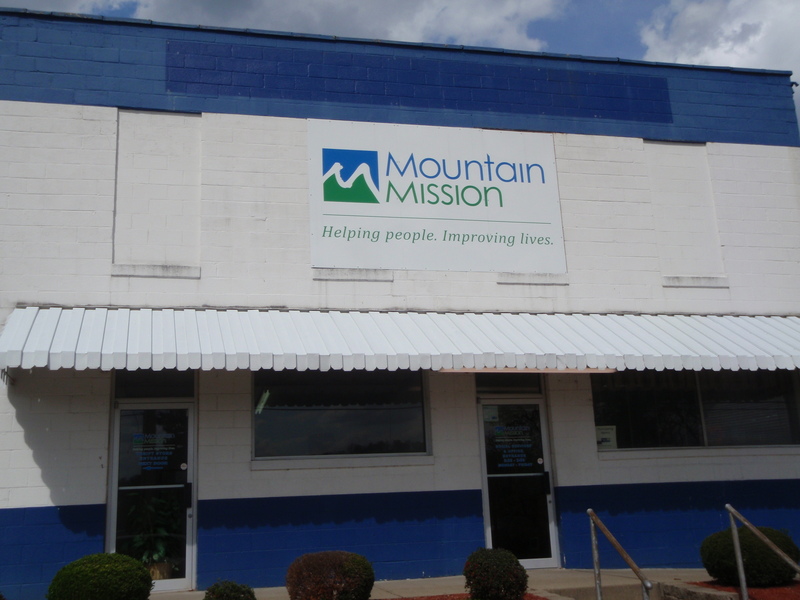 Mountain Mission is continuing to develop its programs, and they’ve bought some more land across the street and hope to eventually be able to open up a soup kitchen to add to the food pantry and thrift shop. 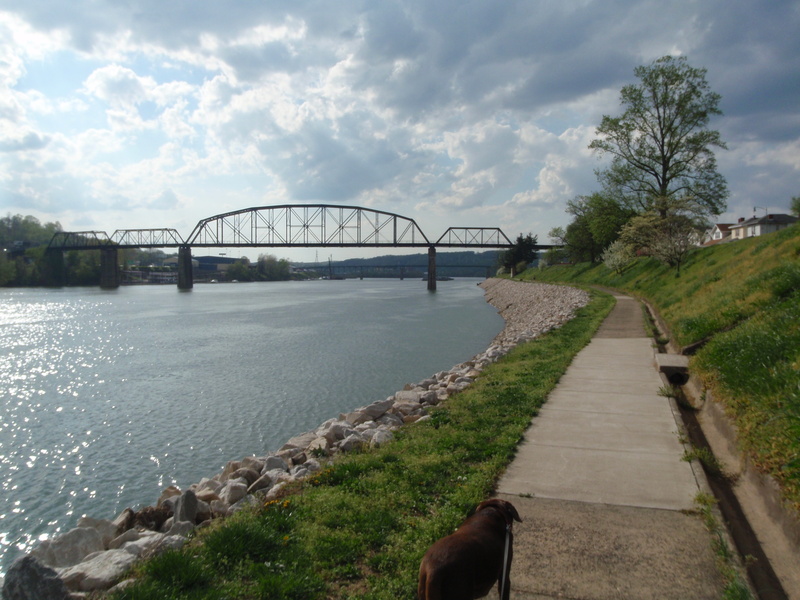 We took some photos, and then they told me about a river trail which was just the thing I needed to finish off my West Virginia walking. 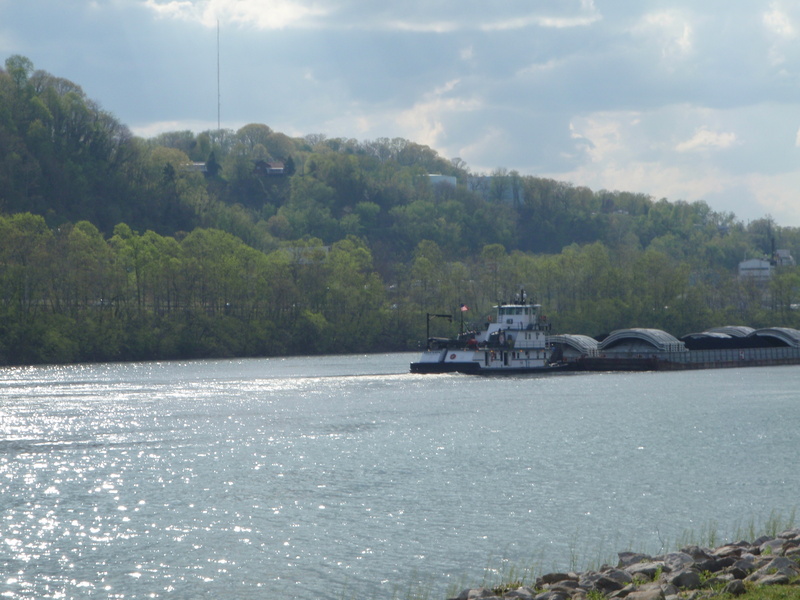 They also gave me good directions to access the river trail, and Tula and I walked about 5 1/2 miles, enjoying the river breeze on a hot afternoon, and we watched a barge pushing a big load of something up the river. Tula seemed to be happy on the long walk – I think her allergy meds are helping. Right downtown there’s a “built-in” little auditorium area on the river – I imagine it’s a good spot for performances and 4th of July fireworks and all. Then, with walking complete, I was ready for a little driving. I was going to be heading south through the coal country, and since coal is such a huge part of people’s lives down there, I did some research last night to see if there was any sort of donation I could make for coal mining families. I eventually ran across the Friends of Coal Ladies’ Auxiliary program, which is located in Beckley in the heart of coal country. This morning I talked with Rhonda, a volunteer there, and she told me a little about how they try to help coal mining families. 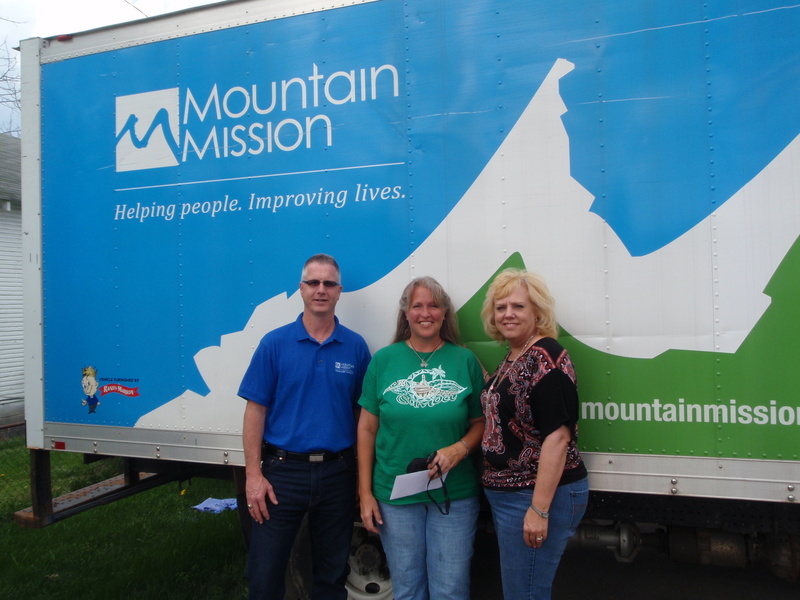 Last Christmas they were able to buy gifts and supply a weeks’ worth of food to over 100 families. They’re there to help when it’s needed. She gave me the number of Regina, the director, and I called a couple times and left a message, and she called me back when I couldn’t answer, so we played phone tag and never did catch up! So I’ll be mailing a donation in – it would have been fun to meet up, but sometimes it’s not always possible. 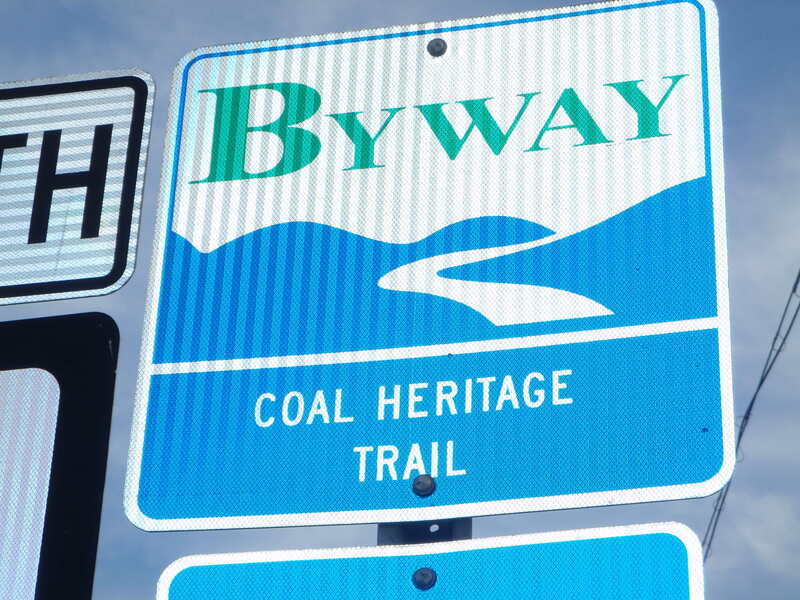 Even though it was late afternoon, I knew I still had a couple hours of daylight, and I made the decision to drive along the Coal Heritage Trail – along narrow, twisting mountain roads, and through dozens of little coal towns. 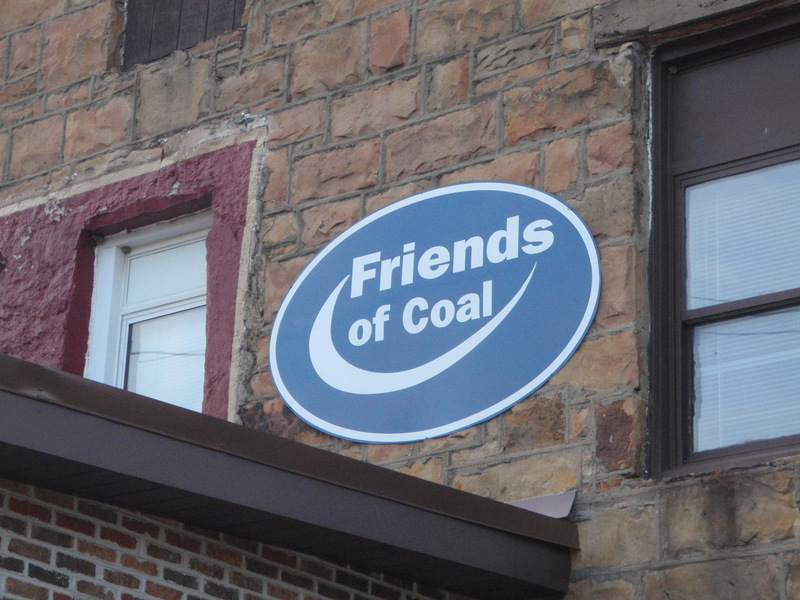 I actually found the Friends of Coal logo on the side of a building in one of the towns. My guide book says the stores are company stores, and I don’t know if the housing is company housing – some of the homes have certainly seen better times. Some of the little towns seemed to be so far from basic stores that I thought about how tough it must be to live there. And I wondered how long the bus routes are! But I did pass through a couple bigger towns, and that’s where people seemed to be hanging out, and there were grocery stores and gas stations and all. Every now and then I passed mining areas – all in all, a fascinating glimpse into a life I know nothing about. The daylight eventually faded and I finished my drive along the Coal Heritage Trail in the dark, and said good-bye to West Virginia, with all 56 miles walked, and all 7 donations given – EPIC for autism awareness, Zion Episcopal Church free lunch program, Soup Opera, Heart and Hand House, West Virginia Veteran’s Home, Mountain Mission and Friends of Coal. On to State #30!